Keep your Prada, your Boss, your D&G, Gucci and Vuitton. I have found the ultimate in vintage fashion: The Bundler. It's like a Snuggie but better. 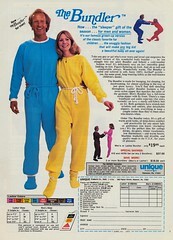 Despite the prevalence of skinny-legged jeans and Lycra, we all secretly miss the swaddling comfort of footie pajamas and the form-flattering fit of a sauna suit. Just admit it. The Bundler combines both of these elements of haute couture in a mixture of primary colors and a washing machine-safe terry cloth/acrylic blend. Throw in a sassy rope belt and you will have the one piece of clothing that you'll never want to take off. Unfortunately, the Bundler isn't available any more. Some things are truly ahead of their time: BetaMax, the DeLorean, Friendster, and Hillary Clinton. Nevertheless, the pull of nostalgia and missed opportunities is strong, and this will cause us no end of suffering. We'll have to settle for our Slankets (and something dull from Banana Republic to wear to the party) and pine away for the sleepwear of yesteryear. I just hope my Snuggie can absorb all my tears. Oh I was ecstatic! I want one I want one! How cool will I look at every gathering I go to! I could get every colour and wear them all week long! Where can I buy this warm, yet stylish Attire!?? Discontinued you say? You just pumped me up to dash my dreams of bundling! The snuggie is a poor substitute for these beauties my friend, we need to get this fantastical fashion statement back into production!